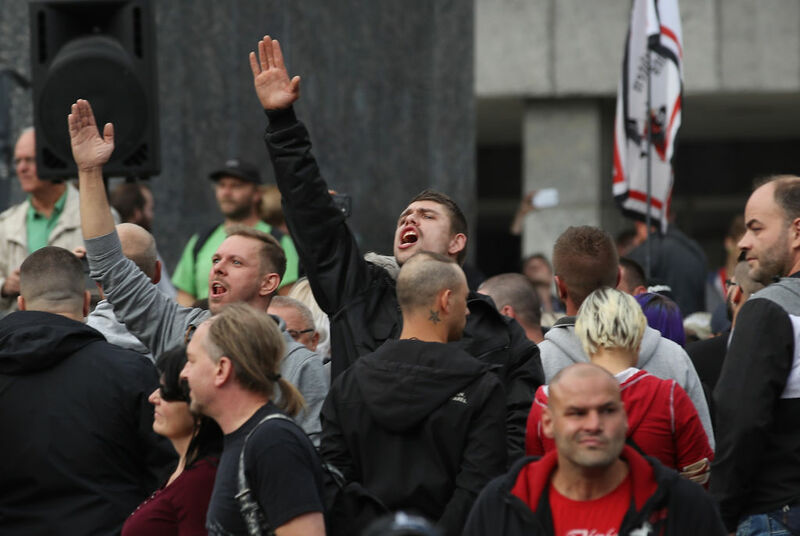 Last week a racist mob terrorized Chemnitz in eastern Germany. This violent street militancy displays the increasing confidence of an emboldened far right. Last week, thousands of unapologetic fascists and their sympathizers marched through Chemnitz, a city of 250,000 people in the eastern state of Saxony. Triggered by the suspected murder of a thirty-five-year old Cuban-German man by two asylum seekers, the protests mobilized unprecedented numbers of anti-immigration militants. Groups of fascist thugs harassed and shouted at locals who looked like they were not white, chanting “Foreigners out!” Local police appeared either overwhelmed or uninterested in doing anything about it. What happened in Chemnitz did not begin yesterday. It represents a qualitative escalation of an ongoing radicalization and growth of the far right across Germany. This is facilitated by the electoral successes of the Alternative für Deutschland (AfD), which soared to over 12 percent of the vote in the 2017 general election. While migrant numbers have in fact fallen significantly over the last three years, public anxiety about immigration has continued to rise, as the question becomes ever more central to German politics. The events in Chemnitz are, in fact, very much in line with the everyday discourse in right-wing social media, blogs and forums. Even many on the German left tend to dismiss the notion that the “refugee crisis” is capable of stoking a degree of civil unrest that could spark a total crisis of the system. They see this as little more than a shallow talking point raised by marginal online racists or far-right conspiracy theorists. But this attitude is little but a self-comforting delusion. And one that needs abandoning. For when you begin to take these comments seriously, you realize that relatively large segments of the political right think that they are already building up to their own dark version of a revolutionary situation and are consciously working to move the process forward to the next stage. Right-wing extremist arguments almost always rest on the state’s alleged failure to deal adequately with migration. There is a reason for this. It serves to justify a position in which the Right’s actions can be construed as “self-defense.” Under the German legal system, violence committed in self-defense cannot be punished; the claim of self-defense in the face of “state failure” thus provides intellectual justification for openly racist displays of vigilante “justice.” The racist mobs in Chemnitz are a forewarning of what this form of justification could imply, and what German society can expect from the far right in the future. A striking example of this outlook is detailed in an article entitled “Chemnitz’s Turning Point 2.0?” published on the right-wing German blog Politically Incorrect. The argument works by way of a biological analogy: the riots and mobs are depicted as the natural, self-preserving reaction of a national population’s healthy immune system against a harmful foreign invader. Nowhere in Germany, we are led to believe, is this “immune system” as healthy as in the area surrounding Chemnitz. It is high time the Left started taking this kind of statements seriously. To understand how deeply these ideas have penetrated German political discourse, we need only look at the AfD, the country’s ascendant far-right parliamentary party, and one of its chief ideologues, Björn Höcke. Höcke leads the party in the federal state of Thuringia, and regularly appears as a speaker at AfD-sponsored rallies and events. The far-right thinker has long peddled his own, unique brand of revolutionary thought. His speeches often reference ideas from the likes of Antonio Gramsci, Vladimir Lenin, and a smattering of other vanguardist thinkers. In a speech given last year at a conference organized by the right-wing magazine Compact, for example, he suggested that Die Linke parliamentary chair Sahra Wagenknecht (unlike Lenin) lacks the courage to split her party for the sake of the revolutionary cause. Reading between the lines, it becomes clear that Höcke means that he himself does have the courage to lead such a split. The fact that Höcke is serious about this is shown in his recent book Nie zweimal in demselben Fluss (“Never in the Same River Twice”). In it, he outlines his vision of another Germany, the establishment of which would take several generations of sustained political effort. It is an alarming document that shows Höcke’s ideas for Germany can only be realized through a right-wing revolution. The title of the book, borrowed from the Greek philosopher Heraclitus, shows that Höcke is building on an understanding of history in which each society is always in a process of transition to new forms of rule. For Höcke, we today face the “final stage of the degeneration of democracy,” which will be followed by a phase of absolutist autocracy. This transition can only be achieved through a “renovation” — Höcke’s euphemism for revolution. There is no doubt that his fascist theory is steeped in fantasies of the putsch, the violent seizure of power. And yet he remains one of the AfD’s most important regional leaders. Höcke shrouds this point in legalistic terminology, but its real meaning is clear: he is suggesting that public officials and civil servants should disobey orders. In other forums, he speaks more bluntly. At right-wing demonstrations, Höcke often feels confident enough to call on police officers to refuse the orders of their superiors. His approach ultimately relies on splitting the judiciary, police, and military into two camps: into supporters and opponents of his revolution. This means undercutting the government’s authority over the state machine — an essential component for a revolution or coup. This scenario is easily dismissed as fantastical and alarmist. And yet Höcke’s focus on the “state and security apparatus” evidences a fine-tuned practical sense. This third front is a new component of his “people’s opposition,” which — drawing on the work of Rosa Luxemburg — he conceives as consisting of both a parliamentary wing and a street movement. Höcke has likely adjusted his perspective after assessing developments within his own party. After all, the AfD has become a home for policemen, soldiers and judicial officials who fall politically in between conservatism and militant right-wing extremism. Of the AfD’s ninety-four members of parliament, thirty have links to the security, legal, or military sectors. Four MPs are former prosecutors, senior prosecutors, or judges. Among them is former Dresden judge Jens Maier, who co-organized the Pegida demonstrations and is known for his particularly crass verbal attacks on Muslims. Seventeen AfD state parliamentarians have connections to the military. Seven others have connections to the police. The AfD in the northeastern state of Mecklenburg-Vorpommern has become home to some particularly questionable police officers. One leading member, Nikolaus Kramer, comes from the extreme right-wing fraternity scene, shares pictures glorifying Nazi soldiers on social media (he once commented on a picture of SS officers with the line “a black bloc isn’t always a bad thing”), and maintained a second Facebook profile on which he “liked” right-wing extremist groups. Perhaps scariest of all is the case of the terror suspect, former police officer, and AfD member Haik Jaeger. He is part of the oft-ridiculed far-right “prepper” scene, who stockpile food and build bunkers in preparation for the collapse of the social system. He was a member of the prepper group “Nordkreuz,” which was founded by another Mecklenburg police commissioner and recruited heavily out of the military reserve. This organization as well as Jaeger himself are accused of terrorism due to their alleged plans to assassinate political opponents. Nordkreuz was ultimately discovered because it emerged in connection with an investigation into the case of military lieutenant Franco A., who made kill lists of his political opponents. This man’s case is known throughout Germany, having spent a year falsely posing as a Syrian refugee as part of a plan to carry out a terrorist attack that would have been attributed to an asylum seeker. Along with A., another soldier, an AfD member, was also arrested. Suspected direct links between the Nordkreuz and Franco A cases were not substantiated. However, the connections between the two do point to the possible existence of networks within the state security apparatus which are not only lying in wait for the system to collapse, but even, as in the Netflix series Designated Survivor, looking forward to and helping to accelerate the process of destabilization. Away from the survival shelters, the second front in Björn Höcke’s “People’s Opposition” has made its appearance out in the open, on the streets of Chemnitz. As with Pegida demonstrations, there exists no clear way to distinguish between who holds which right-wing extremist identity. “Reichsbürger” (people who reject the legitimacy of today’s Federal Republic and claim that the German Reich still exists, somewhat similar to “sovereign citizens” in the US), members of the “new right” Identitarian Movement, and hardened neo-Nazis all join the crowd of so-called “concerned citizens.” Nazi hooligans from the football and martial arts scenes play a major role in giving other demonstrators a feeling of security (as, indeed, they do on Pegida rallies). This violence-seeking and battle-hardened clientele has doubtless created a serious physical threat. Indeed, these militants have already shown their commitment to the deadliest violence. During the war in Yugoslavia, when Serb nationalists wanted to form a powerful army of mercenaries, they carried out targeted recruitment from the hooligan scene of Red Star Belgrade football club. These mercenaries included German militants such as the influential neo-Nazi Thorsten Heise. Heise is an official in the Lower Saxony state chapter of the National Democratic Party (NPD), Germany’s neo-Nazi party. He is also the publisher of the NPD magazine in which AfD man Björn Höcke is alleged to have published articles under a pseudonym. Just a few days after the mob in Chemnitz died down, Björn Höcke poured more fuel on the fire as he called for a silent procession through the city on Saturday, September 1. On social media, Höcke called for the demonstration to have a mood of reverence (heckling, slogans, banners, and even smoking were to be banned). Yet what it represented was yet another sign of right-wing strength. For the first time, the far-right closed ranks, as the AfD and Pegida marched side-by-side in unity. These mobilizations confront the Left with what has, sadly, become an increasingly familiar scene. In former East German cities like Chemnitz, right-wing mobilizations often outnumber antifascist counter-protesters by at least two to one. This is in contrast to cities like Berlin, where far-right demonstrations are typically met by large crowds of counter-protesters who can drown them out and humiliate them politically. The Left now finds itself in a tricky situation. It is only right to criticize the actions of the police and the judiciary. But increasingly, we will have to rely on them to protect our comrades in places like Chemnitz. Nazis must be stopped. We must politicize the demand for the full force of the law to come down on these violent fanatics, including within the state apparatus itself. Otherwise, we risk Höcke’s “third front” of security officials actually becoming part of the far-right opposition. And if that should happen, the dark world imagined by Germany’s right-wing forums will become a bitter reality. A version of this article originally appeared in Ada Magazin, Jacobin’s partner in the German-speaking world. Marcel Tschekow is a social scientist who has followed the development of the AfD since its foundation.